A program designed to update green industry professionals and municipal decision-makers about the early detection and integrated management of the Emerald Ash Borer (EAB) – a destructive invasive insect that was discovered in the Lower Hudson Valley in 2010. 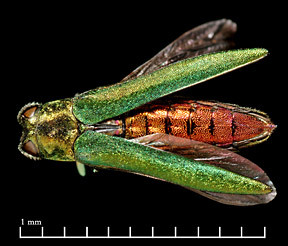 Emerald Ash Borer Natural History, Detection and Community Action Plan. Cornell University Entomologist Mark Whitmore and Cornell Cooperative Extension Educator Rebecca Hargrave will discuss the ID and Natural History of EAB and what your community can do to prepare for this pending pest. Dan Gilrein, Extension Entomologist with Cornell Cooperative Extension of Suffolk County, will review the latest on management of emerald ash borer – what is registered in N.Y. and how various controls are used and are working. He’ll also note some of the other invasive pests that are threatening landscape ornamentals and discuss new control options including the addition of organic materials to the Cornell Tree and Shrub Guidelines. The new NYDEC Be Green Organic Yards initiative will be covered as well. Vegetable growers interested in reduced tillage systems are invited to find out more about the practice at a video conference offered at seven locations on Friday, February 11, 2010, 9 a.m. to 2:30 p.m. Growers who have tested one form of reduced tillage (deep zone tillage) have cut labor by 25 to 60 percent and fuel costs by 25 to 70 percent compared to conventional tillage systems. This video conference will focus on both annual and perennial weed control, residue management and equipment. In addition to Cornell researchers, the conference will also feature a grower panel to discuss weed control, cover crop and residue management, equipment, attachments and fertility. There will be ample time for interaction with the speakers and for discussion, and lunch will be provided. More details on locations and program. Visit the Cornell Reduced Tillage Vegetables website. 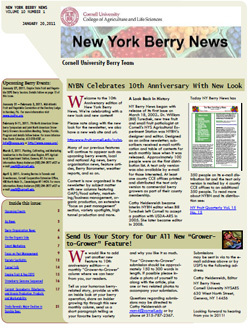 As the New York Berry News begins its 10th year, it boasts a new look and expanded coverage, says Extension berry specialist Cathy Heidenreich, who has edited the newsletter since 2005. Each issue, Heidenreich gathers up news of upcoming berry events as well as local and national berry news. She also assembles timely articles by other berry experts on varieties, pest management, organic production, high tunnels, marketing, business management and food safety. And she’s starting a new “Grower-to-Grower” feature so producers can share their best tips. Find the current issue and archives at the New York Berry News website. If you’d like to receive a reminder by email when new issues are published at the site, email Heidenreich at mcm4@cornell.edu. North American Raspberry and Blackberry Growers’ Association (NARBA) presented its 2011 Distinguished Service Award to Marvin Pritts, berry specialist and chair of the Department of Horticulture, Cornell University, at it’s annual meeting January 5-7, 2011 in Savannah, Georgia. This semester’s theme is Cutting-Edge Horticulture with special seminars February 7 to March 28 seminars. Plant water relations and phloem loading strategies: Is there a link? View the rest of the schedule. View videos of selected seminars, including last year’s series on Horticulture in a Changing Climate. I enjoy flowers and gardening. I am not afraid to get dirty. If you answered Yes to these, then this internship might be for you! Check out our website or Facebook page! For more information, or to apply, please contact Melissa Kitchen at 607-280-4898 or mjb239@cornell.edu. 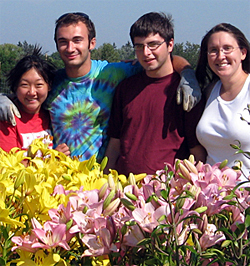 Visit the Department of Horticulture Career Opportunities page for more internship listings. From Jan. 17, 2011 Cornell Chronicle article, Wine and vine experts receive $1.3 million for research to boost eastern wine industry by Amanda Garris. “Vanden Heuvel will also work with horticulture professors Ian Merwin and Alan Lakso to dissect how light and temperature affect grape flavors and aromas — from bitter to fruity — in Riesling and cabernet franc. Plant pathology professor Wayne Wilcox will look at the corresponding effects on disease incidence, so that the project will produce comprehensive cultural recommendations appropriate to a grower’s climate and target wine style. Anna Katharine Mansfield, assistant professor of enology and grant co-investigator, will develop recommendations that will improve wine quality through appropriate fruit processing. Brad Rickard, assistant professor of applied economics and marketing, will investigate advertising approaches to see how they influence consumers’ interest in — and willingness to pay for — wines made in the eastern United States. Several Finger Lakes wineries will be collaborating in the project. There is now free, daily, professional bus service between Ithaca and Geneva. This service is on a trial basis for a couple of months. Please, if possible, use this service rather than taking a fleet vehicle. The N.Y. State Integrated Pest Management ornamentals team is presenting three hands-on workshops for greenhouse and nursery producers this winter. Each has three modules taught by Cornell and NYS IPM faculty – with microscopes, meters, and a chance to bring in your own samples for identification. DEC pesticide recertification and CNLP credits are available. For more information contact Betsy Lamb (eml38@cornell.edu, 607-254-8800). To register, contact the appropriate CCE office. 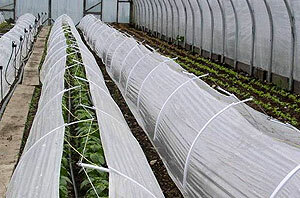 Low tunnels covered with spun row cover provide extra protection for winter greens inside high tunnels. –Walt Nelson, Horticulture Program Leader, Cornell Cooperative Extension – Monroe County, in an article in the Rochester City Newspaper (Local farmers produce year round, January 5, 2011) about the growing popularity of high tunnels and other season extension methods for ‘winter farming’. Visit the Cornell High Tunnels website.